A newly-developed CMOS image sensor to bring out the optimum performance of Pentax interchangeable lenses. Featuring 14.6 effective megapixels and the latest noise-reduction technology, the sensor assures superb image quality. Custom Image functions that allow users to select between six preset options and further adjust image processing, including saturation, hue, contrast and sharpness. The K20D also offers an Expanded Dynamic Range function that allows users to gain more contrast and detail in bright settings. A Live View that allows users to see the full image area to confirm composition, focus status and lighting on the large, 2.7-inch LCD monitor. A grid display may be engaged to help assure the perfect arrangement of an image and Auto focus may be activated by simply pressing the AF button on the back of the camera. Further fine tuning of the image can be confirmed with the 4x or 8x zoom option. A weather and dust-resistant body that allow photographers to keep shooting even in harsh conditions. A PC sync socket for more advanced photographers who use studio lighting. Newly Developed CMOS Image Sensor The Pentax K20D features a newly developed CMOS (complementary metal oxide semiconductor) image sensor measuring 23.4 mm x 15.6 mm. In designing the K20D, Pentax made the significant transition to a higher resolution 14.6 megapixel sensor, rivaling the detail previously only found in images captured with 35mm film. This considerable gain offers 50 percent more resolution than 10 megapixel sensors, and 20 percent more resolution than 12 megapixel sensors. Pentax Imaging (a leading innovator in the imaging business) collaborated with Samsung Electronics (a market leader in developing and producing semiconductors) in the development of the 14.6 megapixel CMOS Sensor found in the Pentax K20D Digital SLR. The larger photo diode in the sensor gathers more light in a shorter time and therefore can respond more sensitively. As a result, the K20D is able to achieve higher sensitivity levels (up to 6400 in the expanded ISO mode). Also, there is a more direct light path to the pixels. Coupled with a high-performance imaging engine incorporating Pentax-original image-processing technologies programmed to yield natural, true-to-life images, the new model assures fine-detailed, rich-gradation images. Large, 2.7-inch wide-view LCD monitor The K20D features a large 2.7 inch color LCD monitor. The wide-view design allows the photographer to view the monitor image from approximately 160 degrees both vertically and horizontally. Since it assures effortless image viewing from a diagonal position, it facilitates low- and high-angle shooting using the Live View function. New Live View function The K20D features a Live View function that allows users to view an image on the LCD monitor during shooting. This feature is beneficial when the photographer moves his or her eye from the viewfinder in specialized applications, such as low and high-angle shooting, or when perfecting composition. The function also allows users to confirm the Shake-Reduction effect on the monitor while shooting. 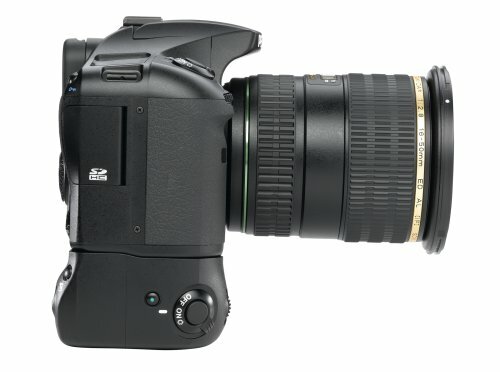 High-performance, high-speed PRIME Imaging Engine The K20D incorporates the Pentax-original PRIME (Pentax Real IMage Engine). Designed exclusively for Pentax digital SLR cameras, the engine ensures well-balanced, true-to-life images with faithful color reproduction by efficiently controlling digital signals transmitted by the CMOS image sensor. It also allows complete control over other photographic factors including white balance and the new Custom Image functions. This imaging engine also features a Double Data Rate 2 (DDR2) memory to assure speedy image processing and high-speed data transfer. Custom Image function The K20D is equipped with a new Custom Image function that lets the user select one of the six modes and adjust an image's processing to their preference by automatically adjusting tone, saturation, contrast, and sharpness. These modes include Natural, Bright, Portrait, Landscape, Vibrant, and B&W image modes. The photographer can make further fine-tuned adjustments to each setting. The effect on each of the primary colors is shown in a radar-type display on the LCD panel. The user can easily see the effect of their adjustments by using the digital preview option. Expanded Dynamic Range Function The K20D adds a dynamic-range expansion function, which allows the user to expand the dynamic range (or range of gradation reproduction) while retaining the proper contrast to avoid white-washed areas. With an approximately 1EV expansion effect, it assures beautiful, rich-gradation images. Dust-proof, water-resistant construction The K20D boasts an extremely reliable weather-resistant and dust-proof construction with special seals applied to 72 different parts of the camera body, including the shutter release button and all the switches, levers, dials. This dependable body makes it possible to use the K20D in the rain or dusty locations without worries. Comprehensive Dust Removal System With Prevention, Removal and Alerting Devices The K20D features the user-friendly Dust Removal system to prevent dust from sticking to the surface of the CMOS image sensor (or low-pass filter). The Pentax-original Super Protect (SP) coating, applied to the image sensor surface through vapor deposition of a fluorine compound, effectively prevents dust from sticking to the surface. In the next step, dust that may remain on the surface will be shaken off when the system shifts the image sensor at high speed. Finally, the dust that is shaken off the image sensor falls onto an adhesive strip positioned at the bottom of the unit, eliminating any possibility of the dust returning to the image sensor surface. This upgraded Dust Reduction system also offers a new Dust Alert function, which shows the user exactly where dust may be sticking to the sensor surface. Hyper Program Function The K20D's Hyper Program function allows users to instantly switch to the Shutter-Priority or Aperture-Priority AE mode from the Programmed AE mode with a simple turn of the electronic dials on the grip. To return to the Programmed AE mode, simply press the green button positioned next to the shutter release button. Hyper Manual Function When shooting in Manual mode, one push of the green button allows the user to instantly set the proper exposure for the subject. Sensitivity-Priority mode The K20D features a unique Sensitivity-Priority (Sv) mode designed to automatically select the optimum combination of aperture and shutter speed for a user-selected sensitivity. The sensitivity can be shifted instantly in 1/2 or 1/3 steps by turning the electronic dial on the back panel. Shutter/Aperture-Priority mode Taking full advantage of the unique capability of digital cameras, which permit automatic shift of sensitivity at any time, the Shutter/Aperture-Priority (TAv) mode automatically selects the most appropriate sensitivity for a user-selected shutter-speed/aperture combination. This mode allows users to experiment with a greater range of photographic expressions with greater ease. Bright, clear viewfinder Featuring a glass pentaprism, the K20D's viewfinder offers an approximately 95 percent field of view and an approximately 0.95x magnification for easy viewing of the subject and effortless confirmation of focus and composition. Coupled with the acclaimed Natural-Bright-Matte II focusing screen, it delivers a large, bright subject image. High-precision 11-point wide-frame AF The K20D's sophisticated SAFOX VIII autofocus system features 11 sensor points (with nine cross-type sensors) to automatically focus on the subject with utmost precision, even when it is positioned off center. When the subject is captured in focus, the in-focus sensor point is automatically superimposed in red in the viewfinder for at-a-glance confirmation. Powerful rechargeable batteries The K20D features large capacity Lithium-ion rechargeable batteries, which can capture approximately 740 images when fully charged. The dramatically improved battery capacity (over the previous K10D) is the result of a new energy saving design. A PC Sync socket for shooting with studio lights. The camera remains weather and dust sealed even when the PC socket cap is removed. Owning several film cameras from Pentax I discovered the LX years ago. An under-rated but super machine, which I still own. After reading some reviews of the K20D I wanted to try one out. Although I live near Baltimore, upper quality cameras by Pentax are difficult to find.Trying to locate the best price from a dealer with good reputation, I discovered Amazon. There are many things about the K20 I like and some things I wish were different. The menu is repetitive. and the instruction booklet like a King novel. I don't care for the LCD, but can't say why exactly. It should have a higher shutter speed than 1/4000th and the processsor could be 14 bit as opposed to 12 bit. It has a great "feel" in one's hand and this is improved by the grip. Looking over how the camera is made brings confidence, in the same way the LX did. Any lens with the p/k mount will work. The in camera processing is to be commended as well. The lens system for Pentax has never seemed as extensive as others, but the quality for the better lenes is there and why have so many choices that are close to each other. How many does one truly need or can carry. I've been a photographer for twenty-five years or so, and eight years of that I was a pro. I've owned Hasselblads and Canons and Nikons and Linhofs. I've owned pentax in the past and loved them. This camera continues the tradition, offering more for your money - more quality than comparably priced cameras, more pixels, more features - you name it. It's priced like an enthusiast camera with enough "pro" features to deserve the appellation. It's no EOS 1Ds MKIII, but the full size image is breathtaking. There's resolution to spare, and the shake reduction works miracles for me. I have a handheld image shot at 1/4 sec that's sharp at 100% crop! And the ease with which you can use the old lenses is just ridiculous. Throw even an old Pentax-M lens on it, set the camera to manual, set your aperture, touch the "Green Button", and the camera sets the programmed exposure - you can adjust from there to your heart's content. You can even specify the kind of program used by the green button - optimized for fast shutter speeds or depth of field - or the sharpest resolution settings of the appropriate lens. You can pick up used Pentax lenses all over for next to nothing, excellent glass on par with any manufacturer. Pentax glass is known for its color saturation and contrast, and this camera shows it off. Just an amazing camera... especially at these prices! All the camera I could ever want. Amazing ergonomics. All the customization I need. Picture quality to salivate for... especially low light capability. I've owned the previous version of this camera, the Pentax K10d which uses the 10 MP chip made by Sony which is also used in several Nikon cameras like the D80, and high ISO pics (like 800 and above) are a bit noisy in these older cameras which require a bit more work to get rid of the graininess. The K20d on the other hand is much cleaner at these higher ISO's with a lot of detail. Most other cameras in this class tend to use a lot of noise reduction at these higher ISO's which makes for a relatively clean picture but these cameras also reduce a lot of sharpness and detail in the process. The K20d leaves the detail and sharpness and lets me use more advanced noise reduction software to take care of the areas that I think need it (try noiseninja or neat image). Weather sealing - awesome for those who like to hike, sports, or street photography. I took my camera and a da* Pentax weather sealed lens in to a snowstorm and had no concerns taking pictures... And this kind of build quality that helps keep water and dust out of your camera is something you can feel: the camera is just solid and feels like it laughs at the elements. Image stabilization in the body - EVERY lens you put on this camera will benefit from image stabilization. I took some pictures in an old church which was not lit well at all, and even without a tripod, I was taking pictures with a 50mm lens at 1/20th of a second and the vast majority of my images were sharp. My old camera without stabilization required me to have shutter speeds of around 1/80th to get reliably sharp images. This is a difference of 4 times as much light the camera needs to make an equally exposed picture! The images at 1/20th are much better exposed and I don't have to turn up the ISO to a point where the image is too grainy like I would have to do on other cameras without stabilization. This feature is especially important if you take pictures indoors... lower shutter speeds without blinding everybody with flash is so much less intrusive. Custom Focus Adjustment - as much as we expect perfection, lenses often have differences in how they focus. Being able to adjust the focus forward or backwards on up to 20 lenses is critical if you want razor sharp images. This is a main reason I upgraded from the K10d... it makes a huge difference! 14.6 MP - This much detail is clearly not necessary... unless you need to crop. I find that if I need a fast lens because of low light (say, if I need an f stop of lower than 2) then I'm usually using a prime lens (fixed focal length = no zoom) and sometimes I can't get as close as I'd like b/c of furniture or maybe the action is happening NOW and I don't have time to move. With this many megapixels, I can crop a lot and focus on the important part of my picture and still have enough detail to print 8x10's or even 11x14's if I want. This was quite an upgrade from the Samsung GX-1S (clone of *ist DS2) I used previously . Pentax have always put out nice products but haven't really been pushing the envelope until now. Auto white balance is still pretty poor. This has been the case with the other Pentax DSLRs. Certainly not a huge concern--especially if you shoot RAW--but a little annoying considering other manufacturers seem to manage it much better. It has a tendency to underexpose. Normally I find myself shooting with +0.7EV compensation and rarely do I run into situations where it blows out the highlights with that setting. Absolutely outstanding image quality. I have shot everything from 110 to large format in film, and the first thing that struck me looking at some of the K20D shots was that it looks like medium format film: the ultra-smooth gradations and gorgeous tones. The lens focus adjustment! Both my Pentax SMCPDA 16-45mm Zoom f/4.0 ED/AL Lens for Pentax and Samsung Digital SLR Cameras and Sigma 70-300mm f/4-5.6 DG Macro Telephoto Zoom Lens for Pentax and Samsung SLR Cameras required some adjustments to compensate for slight front and back focusing. Without this feature I would have been stuck with lenses that would not focus perfectly wide open. The viewfinder. Large, bright, clear. TAv mode. I spend 90% of my time shooting in this; Pentax treats ISO like a third variable in addition to shutter speed and aperture. Simple and brilliant. You just adjust the shutter speed and aperture with the wheels and it tells you the ISO so you can make a judgment call on a good compromise between all three. Clever battery grip design that lets you store a spare SD card and remote. Nice high ISO performance. I have shots at 5000 that look good, though 6400 is pretty noisy. Hands-off noise reduction. Default is OFF, which lets you control it entirely in post-processing. Much rather have that than the water color paintings other cameras prefer to output. Again, AMAZING image quality. I was worried that they were pushing the sensor too far with 14.6mp but they manage to control noise and retain wonderful detail. It does require good optics to get the most out of it, so I would recommend looking at some high quality glass. The 16-45/4 is one of the bargains out there; tack sharp, great color and contrast, and just around $300 new. I didn't purchase my Pentax K20D at Amazon but I can tell you that this reduced price is amazing. The camera is well worth it at the original price! I'm an amateur photographer but it gives me some incredible shots - and actually helps me learn so much more than my SLR or a regular digital zoom camera. Play around with the settings, take a photo and instantly see how it turned out. It's easy enough for a beginner like me and complicated enough that I will have a lot of features and settings to look forward to experimenting with for a long time. As you can see, for everything from macros to landscapes, horses to small animals and more, it's a great camera. If I can take photos like this with my very limited knowledge and experience, you will love it! I purchased my K20D a few weeks ago and I'm very impressed. There are some minor things like the formating, it's 100 times faster than my K100D, the focus is faster also. I was out yesterday and it started raining and I had the wife cover up the K100D, but I just kept shooting with the K20D. No other company's camera can do or say that. I also love that Pentax can use every lens they ever made, and ebay has become a shopping haven for me. I have been really happy with this Pentax K20d, and I am impressed with the 16-45 f.4 lens that I bought to go with it. I initially upgraded from a Canon Rebel 300D to a Canon 40D, it was a nice upgrade but the new Canon wasn't bringing me enough enjoyment to be worth the near thousand dollars I paid for it, and I knew it would lead me to buying lenses that would be too heavy and expensive. I sent it back and a moth later decided to buy the K20d. I was impressed with the low price and low weight of Pentax's mid-range lenses. I honestly thought that the camera itself wouldn't be as good as the 40D but I decided to follow the mantra that lenses are what matter and thought I could sell my Canon lenses and get some great Pentax prime lenses, and a wide zoom lens. I have had the K20d for a over a month, and it is a great camera. It takes the pictures that I want it to take. This is the first digital camera I've been really excited about using and I think it is because it allows me to get the exact exposure I want. The metering won't produce as many decent pictures on full auto as a Canon, because it will always preserve bright highlights. The reviews say that it underexposes, because if you take a picture of a person with the sky behind them, it will consistently keep the sky from blowing out - making the person too dark. At first this means more missed and underexposed shots, but it exposes the same way all the time, and after a week with the camera I found that I always knew how the camera was metering and I now get the exact exposure I want on the first shot far more often than I used to. The camera also makes manual mode far more useable. I like finding a good exposure for the light and then sticking to that as long as I know I am in similar light. If my photos are looking a little bright or a little dark on the histogram, I change the shutter speed or aperture a click. With the green button, I can be in manual mode but have an automatic resetting any time the light changes, from full sun to shade. Anytime I know that there is a big change in light I hit the green button and get the automatic exposure setting, instead of having to spin the dials. I like the ability to change what the dials and buttons do in many of the modes. I can customize what the control wheels do in each picture mode. Also note that many reviews say the K20d does not show ISO in the viewfinder (which was a big detractor for me since it was one feature I really liked about the 40D upgrade) but actually you can customize this and show ISO in the viewfinder instead of the number of remaining shots. You can also change ISO in any mode by holding OK while turning the finger wheel. disclaimer - going to write this in an almost bullet'ed fashion to save time. -14.6 megapixel. i read that its comparable to the 35mm negative in enlargement. that's true. after scanning and old negative at 1200 dpi, the lens captured the same amount of detail. it's pretty amazing. -weatherproofing. in the past, i've always used very old manual cameras -because they're built like a tank, and will never break. and usually don't need a battery. this is about as close as you can get for under 1500$ i believe. and if i'm spending money, i don't want to buy another for many a year. -2 knobs. as someone who's never used a camera with "modes", this is perfect. the aperture and shutter are very easy to control, so the picture comes out how you'd like it. also as a plus, the only "modes" this has are useful. aperture priority, shutter priority, manual, hyper program, and sensor priority. no fireworks, portrait, sports.... etc. -a few plusses i wasn't expecting. double and triple exposures are possible in camera. the anti shake is amazing. i can shoot down to 1/10th of a second with almost no problem. -when shooting in black and white, you can use in camera "filter" effects. it has an ifra red filter that while isn't a true infra red look, it does have a very high contrast, and seems to pull more tones out of any available scene. -at work we use a nikon, the buttons and meter are reversed. so i have to stay used to two setups. -the preset white balances are close, but not dead-on. the transitions are very subtle, so i don't think anyone who wasn't there will know.. but at the same time i don't mind at all. if i don't adjust the white balance, some images kind of take on a weirdly enhanced look. -in very low light, the autofocus has a challenge. again, not a problem because it has a manual focus. At least for now, the K20D and possibly the Canon 50D (but I think it has too aggressive NR), are the peak of the APS-C sensor DSLRs. The theoretical 15Mpix max resolution for lenses has been hit and you can indeed see this in the K20D's photos if you don't have good lenses. In particular, it shows you that Pentax's Limited and DA* lenses (except for the 16-50) are indeed ultra sharp and detailed. My Sigma 17-70 has to be stopped down an extra stop for images to look sharp (my previous 10Mpix K10D was sharper with the Sigma 17-70). The pixel mapping feature alone is worth the upgrade from the K10D. Hot pixels (even the "moving hot pixels" that DPR's review complain about) are cured by running this so you don't have to send it back to the factory to do it. Dust removal lets you find and clear off dust before you end up shooting a big sequence of pictures only to find that you have to PP out a big blob in the upper right hand corner. The PC sync port is a screwlock PC sync port that is robust enough to handle a lot of usage in the studio; it's also weathersealed and can survive a high voltage flash. Liveview is useful (though not as well implemented as Canon's which has contrast AF) for the shots when you don't want to stick your head against the ground and get all muddy. Lens microadjustments (though you can't calibrate zooms at different focal lengths) works great on prime/limited lenses. Recieved my new K20D a few days back. as the camera moved in my hands i could hear something shaking inside. i asked Amazon to replace it, they did it very fast, and the next one has the same problem. i wonder: all K20D are like that? mine was assembled in the Philippines. Takes time to get used to but awesome once you do. I recently bought this unit. My previous camera was a Canon Digital Rebel Xti. Honestly it took some time to get used to the controls. But now I'm used to it and it feels perfect. The colors and the image quality are top notch. In-Body SR performs very well and the image viewfinder is huge. 1-The parameters are not displayed on main LCD. They can be seen through viewfinder and top/small LCD. But main LCD stays dark. You can review the parameters by pressing the info button, but when you change any parameter, the screen turns off. 2-The dial to switch between spot metering and area metering is too close to mode dial. Sometimes you involuntarily change the mode without noticing. 3-The metering is a little bit dark. Some + metering is needed to get some shots. Good camera for general photography but fails for long exposure work! I've been a serious Pentax photographer for over 20 years... so naturally, because of my investment in PK type lenses, I purchased one of the first K20D's as soon as it was available. Please understand, there is a reason for all these great reviews. It really is a good camera in many respects. However, if you have special requirements, such as long exposures (e.g. astrophotography), this is NOT the camera to purchase. If money is no object, consider Canon or Nikon. Canon is especially prized by astrophotographers as being the best DSLR for long exposures. The other annoying problem is that the K20D is terribly slow (and even worse in low light) with auto focus! Again, Canon and Nikon do a much better job. Other than two major complaints.... I echo the positive attributes spoken by others about this camera.